Not long before, I’d worked with Belton Y. Cooper on the book at eventually became Death Traps. The book tells the story of a young ordnance officer of the 3rd “Spearhead” Armored Division assigned to trail along behind the division’s combat units, find knocked-out tanks, assess what had destroyed them and arrange for their recovery. He came away from that experience firmly believing Sherman tanks to be death traps (Presidio Press came up with the Death Traps title; Belton called his draft The Survivors). The emotions still ran deep five decades after the war’s end: his friends had died needlessly, sent into battle in worthless tin coffins, and he’d cleaned their bodies out of their burned tanks using a trash bag and a garden trowel. I liked Belton, and we became good friends. He had a healthy contempt for the very idea of wargames, and never served as a direct influence on my game-design thinking. But his influence definitely made me less eager to upgrade the ratings Brian Knipple had assigned to the Sherman tank. Panzer Grenadier developer Matt Ward suggested offering Shermans with an armor value of “4” in a Golden Journal, and that’s what we’ve done with our Moon Day 2017 issue. There are three versions in U.S. Army colors (the standard M4 with 75mm gun, the M4/76 with a 76mm gun, and the close-support version with a 105mm howitzer) and two for the U.S. Marines (the 75mm and 76mm gun tanks, but not a close-support tank). I’ve seen reams of nerdic analyses over the years comparing the thickness of a Sherman’s armor to that of a Panzerkampfwagen IV plus the angle of armor and probably the incidence of the sun – I’m not sure, I didn’t read that far. Panzer Grenadier armor ratings don’t come from intense scrutiny of data. The data matters, but only up to a point. There are, in effect, only four categories of armor rating that matter to the game designer. Zero and 1 reflect lightweight plating at best, while 6 and above are rarely-encountered very thick and/or well-designed protection. That leaves 2 through 5 as the numbers subject to judgement. That number is used in a pretty simple differential: roll two dice, add the Anti-Tank value of the firing unit, subtract the Armor value of the target unit, see if you got a 10 or better. 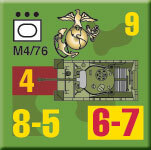 I originally designed the Anti-Tank Table to operate on a single die roll, to avoid the mathematical bell-curve properties that come into play when you use two dice. 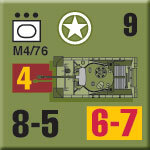 John Stafford, who oversaw development of the Fourth Edition, wanted more modifiers included, which somewhat lessens the relative importance of the tank’s armor rating against things like flank shots, dug-in status and position. So the difference between 3 and 4 is not that great: these are the two numbers right in the middle of the spectrum. And while the Anti-Tank Table no longer is the same table I designed at the age of 15, it does come much closer to my original intent. Rather than a precise reflection of a tank’s armor, the armor value is supposed to represent, “How hard is it to destroy this tank, relative to other tanks?” That includes size and shape and fuel type and other factors beyond armor thickness and placement. 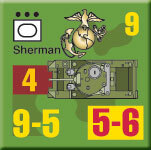 The Sherman is obviously tougher than the Stuart light tank, which receives a “2” rating. And it’s not as tough as the Pershing, which gets a “5.” Is it tougher than the British Cromwell, which gets a “3”? I’m pretty comfortable putting the Sherman and the Cromwell at the same rating, though British and Polish crews appear to have preferred the Sherman. Panzer Grenadier is filled with such choices, probably thousands if not tens of thousands of data points (can that be right? There are 109 of them on the brand-new Sheet 2 from Road to Dunkirk, so it probably could go over 10,000 across all of Panzer Grenadier). 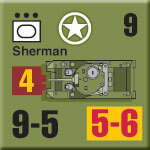 The choice between 3 and 4 for a Sherman’s armor is a pretty close one to my eye, but it’s generated much more feedback than almost any other choice we’ve made in the series. 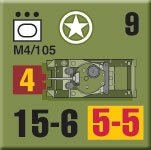 And that brings us to the Belton’s Bane variant in the Moon Day 2017 Golden Journal: 24 nice laser-cut Sherman tank platoons with an armor rating of “4.” You can test out the difference yourself on many cardboard battlefields.